The Globetrotters originated on the south side of Chicago, Illinois, in the 1920s, where all the original players were raised. The Globetrotters began as the Savoy Big Five, one of the premier attractions of the Savoy Ballroom opened in January 1928, a basketball team of African-American players that played exhibitions before dances due to declining dance attendance. In 1928, several players left the team in a dispute. That autumn, those players, led by Tommy Brookins, formed a team called the "Globe Trotters" and toured Southern Illinois that spring. Abe Saperstein became involved with the team as its manager and promoter. By 1929, Saperstein was touring Illinois and Iowa with his basketball team called the "New York Harlem Globe Trotters". Saperstein selected Harlem, New York, New York, as their home city since Harlem was considered the center of African-American culture at the time and an out-of-town team name would give the team more of a mystique. In fact, the Globetrotters did not play in Harlem until 1968, four decades after the team's formation. 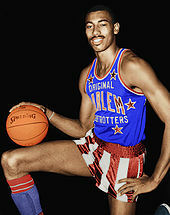 The Globetrotters were perennial participants in the World Professional Basketball Tournament, winning it in 1940. In a heavily attended matchup a few years later, the 1948 Globetrotters–Lakers game, the Globetrotters made headlines when they beat one of the best white basketball teams in the country, the Minneapolis Lakers (now the Los Angeles Lakers). The Globetrotters continued to easily win games due to Harlem owning entire talent pool consisting of the best black basketball players of the country at the time. Once one of the most famous teams in the country, the Globetrotters were eventually eclipsed by the rise of the National Basketball Association, particularly when NBA teams began fielding African-American players in the 1950s. In 1950, Harlem Globetrotter Chuck Cooper became the first black player to be drafted in the NBA by Boston and teammate Nat "Sweetwater" Clifton became the first African-American player to sign an NBA contract when the New York Knicks purchased his contract from the Globetrotters for $12,500 (Harlem getting $10,000 and Clifton getting $2,500. While parts of a modern exhibition game are pre-planned, the games themselves are not fixed. While their opponents do not interfere with the Globetrotters’ hijinks while on defense, they play a serious game when in possession of the ball and about 20 to 30 percent of a game is "real". This once led to an infamous defeat at the hands of the Washington Generals in 1971, to the distress of the watching crowd, after the Globetrotters lost track of a big lead with their tricks and the Generals hit a game-winning buzzer-beater. ^ "Riots to Renaissance: Harlem Globetrotters". WTTW Chicago. 2018-07-11. Retrieved 2019-04-24. ^ "Nat Clifton, one of our firsts in the NBA". African American Registry. Retrieved 2019-04-24. ^ "10 Quick Facts About the Harlem Globetrotters". Portable Press. 2013-12-03. Retrieved 2019-04-24.